Airlines in recent years are charging for baggage and meals which once were covered by the basic fare. In recent months, my municipal marina is separately/additionally charging for electricity and dock boxes previously included in the slip fees, accompanied with subsequent rises in slip fees and elimination of any weekend service, despite a very high vacancy rate in an area of year-round boating. Charging for the metered electric makes sense. We all don't use the same amount. No electric meters here. But liveaboards pay for substantially higher berthage, well over 50 percent of the basic berth rate. That is discouraging. An enterprise that imitates the business practices of airlines is an outfit that I would want nothing to do with. Some "smart" MBA must have been hired to "fix" the marina. (No disrespect intended toward TFers who happen to be MBAs, as they would be highly likely to know how to improve a marina). With that many empty slips, the MBA should be dope-slapped. As an engineer, it is in my blood to bash MBA's whenever possible, but that is another topic!! One thing I found in my area is that many slips are vacant but being paid for by someone. Boats on trips, on the hill, owner between boats, whatever. At my marina we paid for electricity directly to the local utility. Considering how different each owner's boating style and needs are, I consider it much fairer all round to have metered electricity at the dock. Hopefully, not an excuse to simply add a "tax" on top. Why should the owner without AC, for example, pay for the guy running his non-stop? And while we are on this topic, it is about time to assess individual water usage as well. Some boats at our old marina ran fresh water non-stop. We just lived through a major drought. Water is valuable commodity that should be treated as such. Reasonable arguments can be made for metering electricity and water. There is a wide variance in usage among boaters and a flat rate, or included in the base rate, encourages unlimited use. The dock box charge seems like a petty annoyance. If you don't pay do they remove the box? As to the extra charge for liveaboards I don't see the justification once water and electricity are metered. Of course they are adding the extra charge because the market will bear it. I am also a great fan of unbundling the airline fees. For years I flew very frequently with only a carryon and my ticket paid for baggage handlers. Same with the airplane food(?) I didn't eat. My records clearly indicate that I am paying less to fly today (adjusted for inflation) then I did in the 70s. In regard to airlines, I wonder when they will start charging by weight for the passenger. They charge a small fortune for being one pound over in luggage weight, but charge the same for a 100 pound person or a 300 pound person. When getting charged for excess baggage, I once questioned this policy, before realizing the airline employee I was speaking to was considerably overwieght. I got a curt reply. Think the justification is quite easy to make. How much time does the average non live aboard person spend using marina services? Most likely average less than one day a week there. People (and their guests) who live aboard and use the marina bath and shower facilities have a much higher cost factor aside from the boat. While I couldn't put a dollar value on the cost of 2 people taking nice long hot showers every day for a month, there is a significant cost to it. Pretty cheap rates IMHO. Why is the marina so empty? I agree the $6/month is pretty chicken shi.t for the dock box but I'd still pay it. I've always like municipal marinas. You usually get pretty good bank for your buck. These are from the City of Vallejo rate sheet: $7.21-8.86/ft/month with free pump out. Non live-aboards pay $10/month for electricity while live-aboards electrify is included in the live-aboard fee of $216/month. 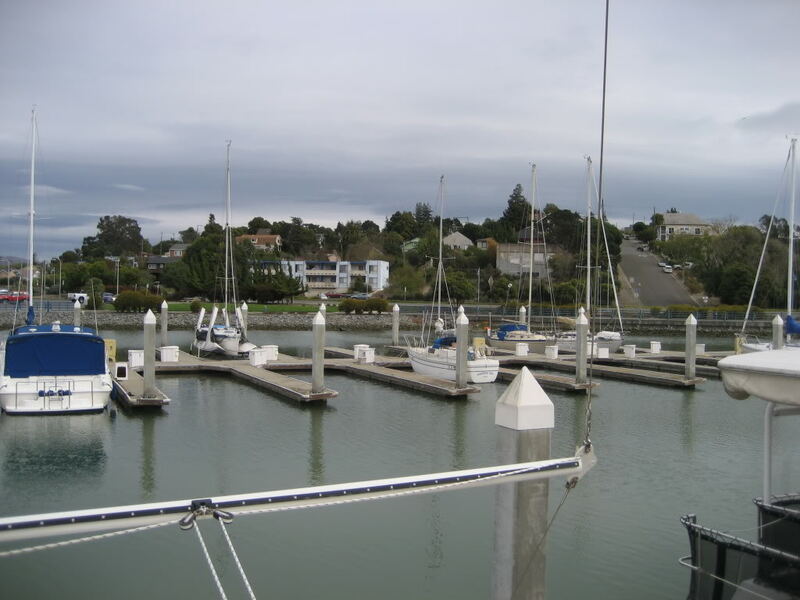 Our rates are $16/ft/month for a live-aboard and add 13% tax on that plus metered electricity. We get 2 free pump outs per month then $15/. Were in North Florida, 20 plus miles from the ocean. As to the airlines, I would be unsurprised to discover that, somewhere in the nether reaches of that industry's strategic planning community, a lot of clever people are at work figuring out how to persuade the traveling public that it's perfectly safe to buy a ticket on pilotless, remotely-operated airliners. The benefits will be endless. Without an aircrew on board, the weight savings alone add up. Then two or three additional revenue seats open up, and they can charge extra for those two seats way up in front, with forward-facing and side windows. This makes a lot of sense to me Ted. Having said that, I like having a few live aboard at my marina. Since we have no paid security, it is nice to have neighbors around all the time. Like this idea when it comes to flying as well. Pay be the pound, we all don't weigh the same either. Any day aboard is a good day. My thoughts are like others in that everyone should be paying for the services they use. Electricity is easy to meter, and we have found that anytime you meter electricity, it makes people think about how much they use, and they use less. Since pump outs tend to be "free" (but do have a cost) and liveaboards do use more marina services I would also agree with liveaboard fees. As far as slip prices going up or down, the marina is probably trying to stay cash flow positive. It takes a certain (often minimal) staff to run a marina and there is strong pressure to keep the monthly outlay of cash below the monthly intake of cash. If less slips are filled, you can only reduce to a certain point then you need to raise rates to meet monthly cash flow. Like this idea when it comes to flying as well. Pay be the pound, we all don't way the same either. In theory, that makes sense. However, it is not practical. Mark mentioned that his marina doesn't charge per kwh for electricity. The reason they don't is that they don't have individual meters for each pedestal. There would be a very large capital cost to installing all those meters and they have made the decision not to do it. Consider the airlines, how are they going to "meter" the weight of passengers? Back in the day wen airline tickets were purchased at the ticket counter, it would have been easy to have a scale in front of the counter. Now, tickets are purchased ahead of time. How is the airline to know what the weight of the passenger is? My guess is that to do practical and marketing reasons, the airlines have considered it but never found a way to make it work. I'll have to ask my son who works as a financial analyst for AA in the flight operations area. Some liveaboards are a blessing to a marina...and the marina often rewards them for it...other liveaboards are a drain. Kinda like all sectors of society...unfortunately not all people in positions of marina leadership are capable of dealing with the variations of liveaboards....or corporate ties their hands. That can be applied to all patrons, but liveaboards often magnify the variations. It could be a logistical reason or it could be the simple matter of airlines do not want to know what everyone weighs. It allows them to have a fixed "cost" when it comes to the weight of the airplane. Everyone weighs 190 pounds and their bags all weigh 25. Itmakes it MUCH easier to account for and forecast costs as it relates to weight. Even when ordering aircraft, they know the weight of each passenger occupying each seat. And then they can determine costs based on that weight. And the manufacturer builds the airplane based on a standard weight. And figures its useful load based on those standard weights. So it permeates the entire industry from the beginning of the product to the end product. It would not be advantageous in any way to do away with standard weights. True, but if the airlines actually weighed each passenger, they would know exactly how the average passenger weighed instead of making guesses. Back in the day when I had to do weight and balance calculations for a little C172, I believe the FAA "average" adult weight was 175lbs. I would hope they have either tossed that or adjusted it upwards. The average weight of my adult patients has to be closer to 200lbs.